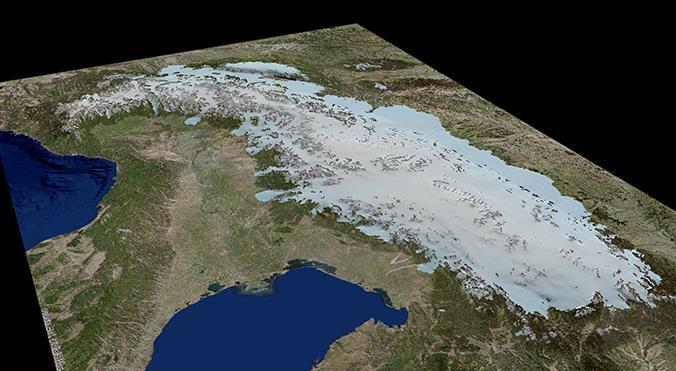 The Alps are steadily "growing" by about one to two millimeters per year. Likewise, the formerly glaciated subcontinents of North America and Scandinavia are also undergoing constant upward movement. This is due to the fact that at the end of the Last Glacial Maximum (LGM) about 18,000 years ago the glaciers melted and with this the former heavy pressure on the Earth's surface diminished. The ice reacted rapidly to climate change at that time whereas the Earth's crust is still responding today to this relatively sudden melting of ice. During the LGM the Alps were also coated with an ice cap that temporarily reached far into the alpine foreland. The extent of glaciation was much smaller here than on the subcontinents of North America and Scandinavia. This is why it was assumed for a long time that the retreat of the ice cap back then did not play a significant role in the steady uplifting of the Alps today. However, an international team have now been able to show that the loss of the LGM ice cap still accounts for 90 percent of today's uplifting of the Alps. Vertical motions of the Earth's crust are mainly caused by tectonic deformation due to movements of tectonic plates, and by volcanism, and unloading of water, ice, and sediments. The movement of the crust can be measured by geodetic methods via satellites and ground stations. For old, tectonically stable continents like the subcontinents of North America and Scandinavia it has been known for a long time that vertical motion is almost exclusively caused by the so called postglacial "rebound effect" - i.e. the upward motion of the crust due to the thawing of the glaciers. In young mountain belts such as the Alps, however, complex mechanisms come into play that mutually effect each other: The African Plate subducts below the Eurasian Plate, and the Adriatic Plate -- a sub-plate of the African Plate -- moves counterclockwise below the Eurasian Plate. Furthermore, as in Scandinavia and North America, there is unloading due to erosion and sediment transport, and "deglaciation". The causes for today's uplift of the Alps has been a matter of debate for over a quarter of a century. For a long time it was assumed that the uplift is primarily caused by erosion and sediment transport, mainly by rivers, towards the foreland. The new study compares by how much erosion, ice unloading, and local tectonics contribute to the vertical motion of the Alps. The scientists use models supported with drill core data to show that the better part of postglacially, and therewith after the end of the main glacial phase, eroded material was deposited within the orogen. Hence, this process can be excluded as a main cause for the alpine uplift. The models, however, show that, just like in Scandinavia and America, the uplift-signal is best explained with a relieving compensatory movement after the decline of the LGM-glaciers: Within only 3,000 years the glaciation of the Alps decreased by about 80 percent. Only about 10 percent of today's uplift can be attributed to sediment unloading. Locally, especially in parts of Austria, tectonic effects add to the uplift, likely caused by the circular motion of the Adriatic sub-plate. With their models the scientists are able to show that the glacial load weighed about 62,000 gigatons, while the postglacial sedimentary unloading only accounts for about 4,000 gigatons.